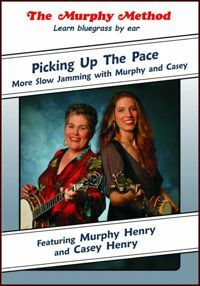 Picking Up The Pace: More Slow Jamming with Murphy and Casey: Sixteen new tunes, several different keys, a little more speed, and tight trio singing with our good friend David McLaughlin on mandolin. All songs include banjo, guitar, and mandolin or fiddle. We tackle some fiddle tunes, some old favorites, some hymns, and the O Brother Where Art Thou classic “Girl (or Man) of Constant Sorrow.” Each song includes a space for you to play along while we chord. Guitar chords are shown in a small box on screen. For all instruments. Entertaining and instructive! I Saw The Light, On and On, Salty Dog, Amazing Grace, Girl of Constant Sorrow, Old Home Place, Boogie Woogie, Roll On Buddy, Nine-Pound Hammer, Mama Don’t Allow, Arkansas Traveler, Liberty, Soldier’s Joy, Wildwood Flower, Leaning on the Everlasting Arms, Sitting on Top of the World. Want to learn breaks to these songs? Here's a list of where you can find them.